4. Which of the following statements is correct about the balancing of a mechanicalsystem? 7. Which of the following statements are associated with complete dynamic balancing of rotating systems? 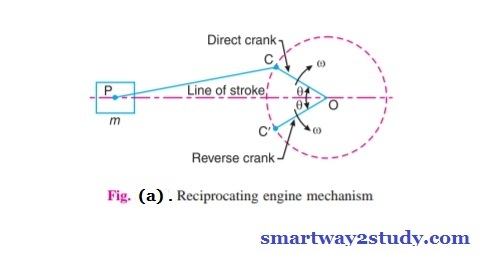 We have discussed in previous chapters, the various forces acting on the reciprocating parts of an engine. The result of all the forces performing on the body of the engine due to inertia forces only is known as unbalanced force or shaking force. Thus if the resultant of all the forces due to inertia effects is zero, then there'll be no unbalanced force, however even then an unbalanced couple or shaking couple will be present. FB = Force acting on the crankshaft bearing or main bearing. Since FR and FI are equal in magnitude however act in opposite direction, therefore they balance one another. The horizantal component of FB (i.e FBH) acting along the line of reciprocation is also equal and opposite to FI. 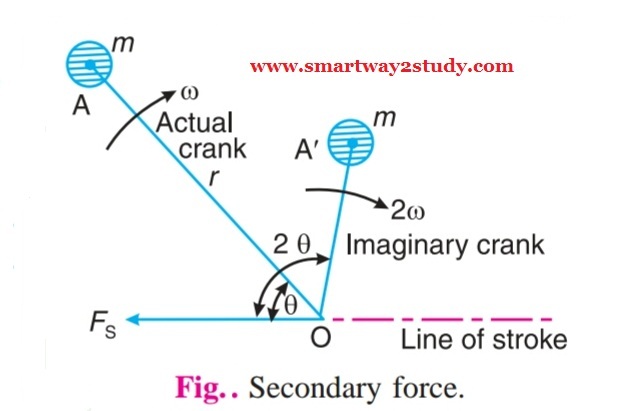 This force FBH = FU is an unbalanced force or shaking force and required to be properly balanced. The force on the sides of the cylinder walls (FN) and the vertical component of FB(i.e FBV) are equal and opposite and thus form a shaking couple of magnitude FN X x or FBV X x. From the above statements we tend to see that the imapct (or) effect of the reciprocating parts is to produce a shaking force and a shaking couple. Since the shaking force and a shaking couple differ in magnitude and direction during the engine cycle, therefore they cause terribly objectionable vibrations. 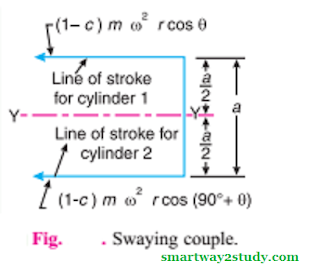 Thus the purpose (or aim) of balancing the reciprocating masses is to eliminate the shaking force and a shaking couple. 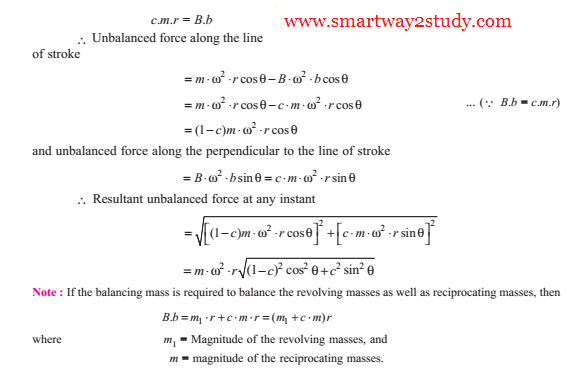 In most of the mechanisms, we can produce the shaking force and a shaking couple by adding appropriate balancing mass, But it is usually not practical to eliminate them completely. In otherwords, the reciprocating masses are only partially balanced. Note : The masses rotating witht he crankshaft are normally balanced and they do not transmit any unbalanced or shaking force on the body of the engine. We have discussed in the previous article that the horizantal component of the force exerted on the crank shaft bearing (i.e FBH ) is equal and opposite to inertia force (F1). This force is an unbalanced one and is denoted by FU . The expression (m.ω^2 .r cos Θ) is known as Primary unbalnced force and (m.ω^2 .r [cos 2Θ]/n ) is called secondary unbalanced forces.